These holders are intended for premium long-term archival storage or display of your coins. Made of inert high impact, crystal clear polystyrene a 100% archival plastic the holder will not harm coins. - 100% Archival Plastic. No PVC! These snaps work with Eisenhower, Peace, Trade, and Morgan Size Dollar Coins - all 38.1mm in diameter. They DO NOT work with Silver Eagles, which are 40.6mm in diameter. 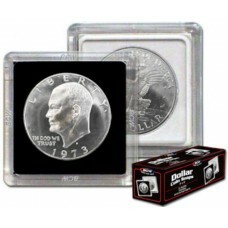 Do you have any questions about Box of 25 BCW 2X2 Coin Snaps Silver Dollar (38.1Mm Diameter)?